Maker education is a very popular topic today. Students are being pushed in this direction for a few reasons. First and arguable most important is the need for students to be able to solve problems, and think critically. Our world does not need factory workers anymore, we need people who can innovate to solve complex problems. Next is the career needs in science, technology, engineering, and math. These areas are a few of the high growth areas today. Maker spaces provide students an avenue to channel these skills through. 11 year old student Ryan Gramp invented the iShoe. This invention attaches to your shoe and in just 10 minutes, can charge your cell phone for an hour's use! This device uses the kinetic energy generated through taking steps, and turns it into usable power. Tokyo subways have the same technology embedded in the tiles that line entryways to the trains. Each step that is taken is absorbed into their piezoelectric energy generating floor. This power is enough to power each of the stations along with the subway trains themselves creating a self sustaining system. 19 year old Boyan Slat has invented a device that he claims could clean up some 20 billion tonnes of plastic waste from the world's oceans. He came up with the idea of a series of floating booms and processing platforms designed to collect floating plastic rubbish. The 'ocean cleanup' concept is designed to capture the floating plastic, but allow lifelike fish and plankton to pass through unharmed, while saving the waste materials to be recycled. 13 year old Mallory Kievman created a lollipop that cures hiccups. Her solution is made up of vinegar, sugar, and lollipop. Her invention has gotten her global recognition and enrollment into numerous start up companies. These are amazing ideas, and certainly things that you want all of your students to be doing. The goal of your maker space should be to create a space where kids can create real, physical items, that solve their passion questions. Here is my recommendation of where to start. This visual is the simplest representation of this process. Any of the visuals you see online can be used to mold your students thinking so long as you understand one thing. 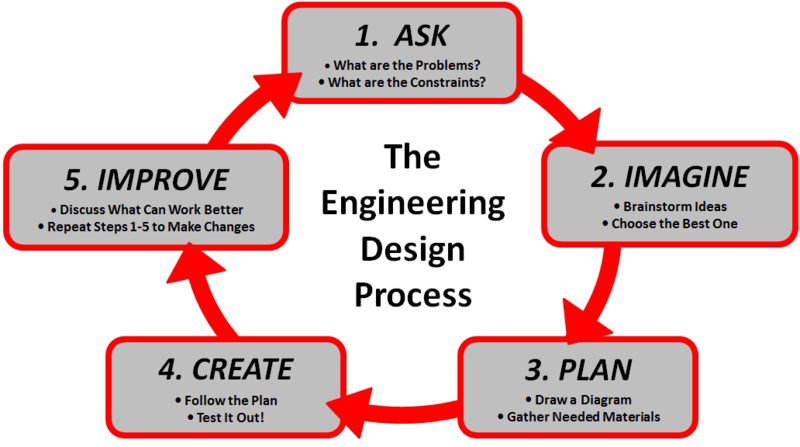 The engineering design process is not linear. You can bounce from one step to any other step and back. Students need to know this, and experience it for themselves! Draft two supplies - Mostly wood products to test sturdiness, functionality, and product design. For 95% of the products made in this maker space, this is the final stop. Draft three - The goal when finalizing a project, is to make something that is professional grade. These projects are costly and should reflect the best of the best. I would recommend you reserve these types of builds for school displays, honorary grade level projects, or larger audience competitions. Ultimately, building with these supplies is completely up to you.